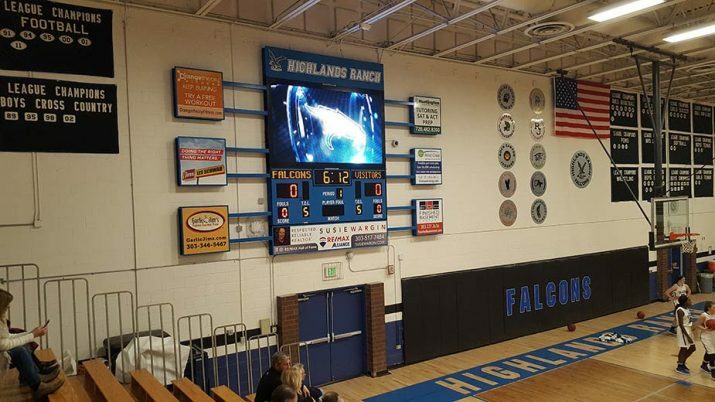 Highlands Ranch High School in Colorado recently welcomed two new basketball scoreboards and an indoor video display, designed and manufactured by Daktronics. The video display is used for all gymnasium sports as well as other school activities held in the gym. Designed to easily transition from one sport to another thanks to the easy to use Daktronics Show Control System, the video board measures 9 feet wide by 5 feet high with 10-millimeter line spacing. The order included a bank of hours for the creation of digital content to be produced and delivered by Daktronics Creative Services. Featured graphics for all sports include basketball, volleyball and wrestling. With animations in hand from day one, the school is off to a running start with professional content. Video scoreboards are a growing trend in the Denver area. Highlands Ranch is one of three recent installations in the metro, being one of the largest in the state’s high schools to date. Legend and Evergreen High Schools are also recent Daktronics video customers. As fans travel around the region, the new displays generate interest from gym to gym. One of the reasons why the schools choose Daktronics is the local support and sales staff. Jee Yoo is a local technician, along with Sales Representative Scott Dieck, who are on site and ready to be hands-on at any given time. Helping schools set up funding also takes much of the struggle out of the process. Dieck and the Daktronics Sports Marketing team worked with Highlands Ranch to set up price point agreements for local sponsorships. Once a school secures the funding needed to cover their expenses, any additional revenue raised goes straight into their pockets. Their display cost is covered and they can create additional opportunities to fund school endeavors year after year. Daktronics LED video and messaging display technology offers a long lifetime with consistent, industry-leading performance and low power consumption, providing value and excitement for years.